Unfortunately, Jumping Bllux is no longer available in the Apple App Store, as it was pulled from the Store by Apple for not being updated recently. There are currently no plans to update the game. If you have purchased Jumping Bllux on the App Store, it is still available to download from the Downloaded section of the App Store, where you can download previously purchased apps and games. This page is left online for posterity. Jumping Bllux is a physics platformer, where you roll a ball around each level and use Blue Orbs to cause grey blocks called Bllux to jump into the air. 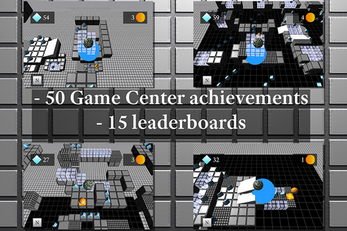 You navigate around each level by tilting your device and riding the jumping Bllux. 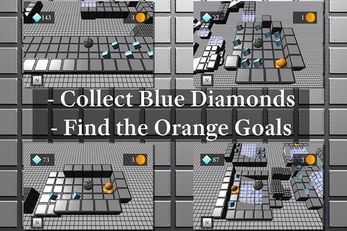 Along the way, you collect Blue Diamonds and Orange Goals to complete each level and unlock Hard Mode. 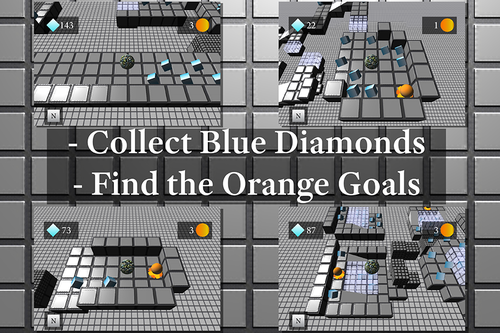 Can you find all the Blue Diamonds in each of the 15 levels? 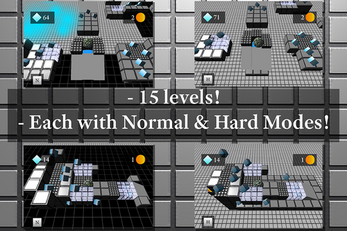 As an added challenge, each level has an unlockable Hard Mode, making for 30 unique levels of gameplay!